It is possible to generalize. There are distinct flavours of everyday life which announce "Europe" or "Asia". Off the main roads in an European city you will still find a slow neighbourhood life. People will greet each other in a leisurely way, and be curious about the tourist clicking photos, but be too polite to ask. It takes a couple of weeks before you are included into the life of the neighbourhood: at the corner cafe they know what you want, the baker has a smile for you, and the grocer exchanges a few words in some shared language. I walked away from the tourist’s Bangkok into crowded little roads. These are exemplars of busy Asian street life, the anonymity of crowds but also friendliness to total strangers. These streets are the last bastion of the truly free market, for example, the lady at the corner in the photo above, selling clothes. The jumble of wires is a sign of a population far too busy to be weighed down by fear. There is a lot more of brisk walking, and substantially less window shopping. The weight of people is larger than what you find in Europe, as a result personal space is very small. Space always seems to be at a premium, except in centres of power like Tienanmen Square. Businesses are stacked above each other in vertical growth. I always like to look into a barber shop, with its deceptive air of leisure while business is actually being transacted as fast as possible. 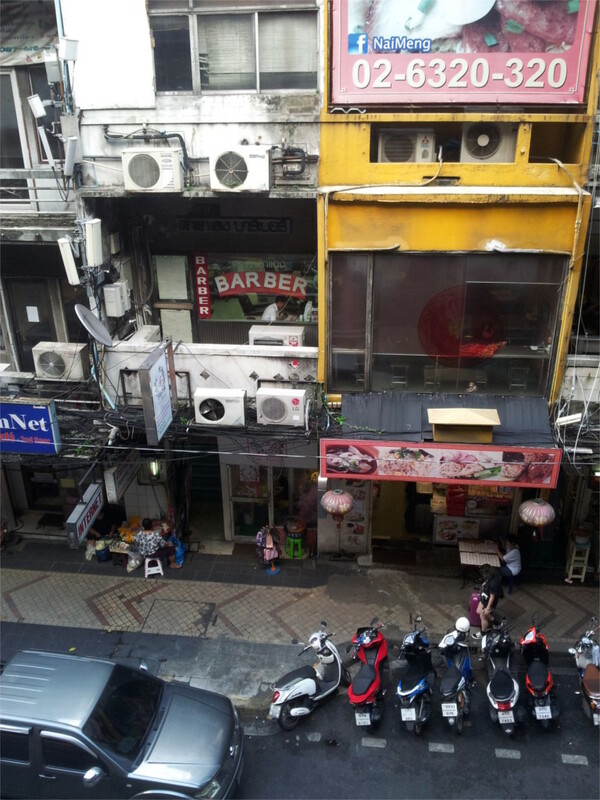 Bangkok’s barber shops are no exception. Generalizations structure travel, but its pleasure comes from the particulars of the people you meet. My experience of Bangkok was made more pleasant by the sing-song greeting of the corner shop which sold us large plastic bottles of water, the waitress who pressed a glass of fresh orange juice for me when my tongue caught fire from the green curry she served, and the lady with her many shopping bags who guided us through a maze of streets to where we could get a tuktuk. I had read reports of the death of Thailand’s king Bhumibol Adulyadej, or Rama IX in mid-October when we were in the middle of planning our trip to Bangkok. Once we were assured that tourism would be undisturbed, I put it out of my mind. We spent a week out of touch with news in Myanmar before we arrived in Bangkok. The Grand Palace was the first thing on our minds. We arrived on a sweltering hot morning and joined the tail of a long queue. My mind was a blank. By the time we reached the gates of the palace, I was on the verge of heat exhaustion, and was clearly not thinking clearly. It was only late in the day that I realized that the crowds of Thai people dressed in black (in the featured photo) must be mourners. The Family tells me that I was incredibly slow that morning. While we wandered through the temple of the Emerald Buddha I drank water from bottles of water with blacks bands on them which were handed out free in kiosks manned by women in black. The side galleries with paintings depicting the story of the Ramayana were lined with people in black patiently queueing to enter a different part of the palace. From inside a large pavilion we could hear a rhythmic chant which we had no difficulty in recognizing as a religious ritual. Then we saw the odd collection of objects whose photo you see above. The rusty gears of my mind engaged briefly and I realized that this must be part of the king’s funeral. 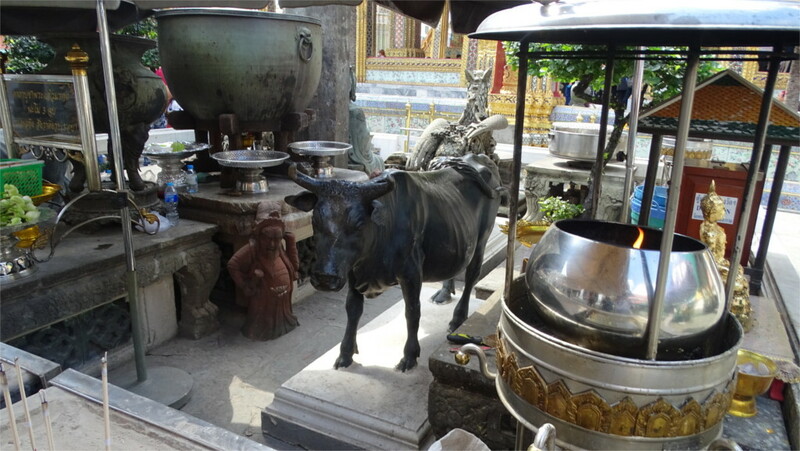 The flame, the cow, the horse, the cooking pots, are ritual objects, some of which are used in modern Hindu funerals in India, others in older Hindu funeral rituals. Part of the palace was closed off. This was when I finally connected the dots. When we exited the palace and found food being served on the roads, we knew what it was for. We tasted a little of what we could see. The rice and curries and sweets were not what we would recognize as Thai food, but they were wonderful and quite appropriate to the extreme weather. Through the rest of our stay we would encounter other signs of the month-long state mourning. We’d timed our stay to coincide with the November’s full moon, the supermoon. Normally there would be a celebration at this time. This year it was cancelled. The next day we walked into the Bangkok Art and Culture Centre. The space inside is a wonderfully adaptable gallery, as you can see in the photo alongside. Apart from an interesting group show in the lobby, the whole space was taken up by an exhibition of photos taken by the late king. I learnt later that King Bhumibol had been interested in photography since his teenage years. The day had raised my curiosity about Thai royalty. I sat by bar in the rooftop pool of my hotel that evening and read a little of recent Thai history. I was impressed by the political skill of the late king, who in 66 years as head of state is said to have used the successive military coups to consolidate his position. Rama VII had been forced to create a constitution in 1932, sealing the process of modernization begun during the reign of the historical king (Rama IV) made famous by Yul Brynner. The slow marginalization of the king in the previous half century seems to have been cleverly checked and reversed by Rama IX. We decided to spend a couple of days in Bangkok imagining a relaxed time in a large city on the way back from Myanmar. We did manage to relax, but in taxis stuck on the road. On one memorable occasion, during the evening rush hour, our taxi took more than half an hour between two successive traffic lights. According to a year-old article, during the evening peak hours, Bangkok’s traffic moves at one-tenth the speed it would have on a clear road. On the average the traffic moves at half the speed that it would have on a clear road. One sure sign of bad traffic is multiple layers of roads and flyovers. In the featured photo of Bangkok (taken near Sukhumvit) you can see the road, then the pedestrian walkway from which I took the photo, a flyover for road traffic, and an elevated corridor for the metro. This photo was taken a little after three on a weekday. Two hours later, the traffic was a standstill. I’ve seen such multiple layers of roads in China before, and they are now coming up in India. Some claim that Bangkok’s traffic has become worse since the government decided to refund the tax to first-time car buyers. Mumbai had prepared us for Bangkok. When we were stuck in traffic, The Family and I tried to take it as an opportunity to spend some quality time talking to each other. When we couldn’t bear the incredible joy of being thrown into close contact with each other for long, we took the sky trains. The coverage of the city is minimal, but at least it can be used to reduce the distance you have to travel in traffic. Another joy of travelling by metro is that you get a view of really kitschy hoardings meant to cover up construction sites (above). Growing up in ancient India, I thought cars were either white or a dull grey. Doctors were subject to a different rule; they could have black cars. My grand uncle was an iconoclast. He would emerge with his stethoscope in hand from a dark blue car with cream coloured leather seats. That was it. Until the advent of red cars much later. So I’m still taken by surprise when I see pink cars. They have to be special. 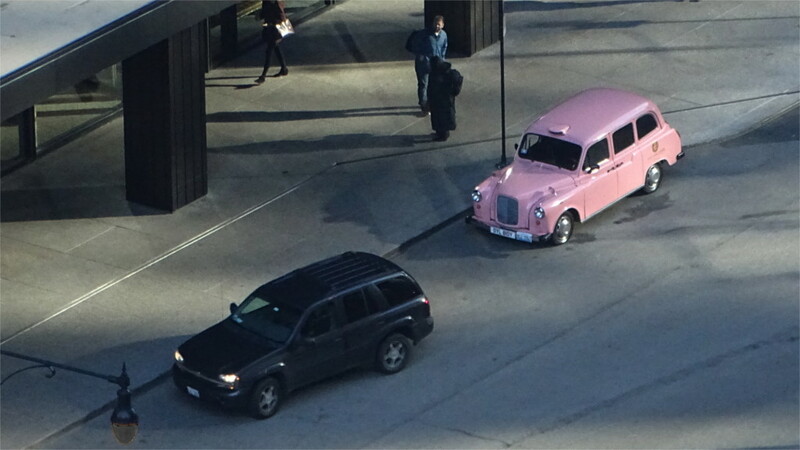 The pink car which I saw on Valentine’s day in Chicago was clearly special. It stood in one place for hours, while the dull traffic flowed around it. The tarmac on the road was the grey of charcoal. The buildings surrounding it were dark and brooding black, or the brutal colour of concrete. The pink Valentine car was a touch of joy in the morning. In the colourful and boisterous traffic of Bangkok you might not be surprised by cars coloured bright greens, yellows and blues. But when I see taxis in pink I’m still shocked. I was taken aback at the Bangkok airport when I saw a whole line of taxis in pink, as I got into a green and yellow cab. After that I kept my camera handy, and managed to take the featured photo while we were stuck in traffic next to one of these flamingos of the road. On a walk near the Bell and Drum Towers of Beijing I saw a pink car parked primly on the road bordering the plaza between the two towers. I’d begun to get used to seeing pink cars on the road in India by now. 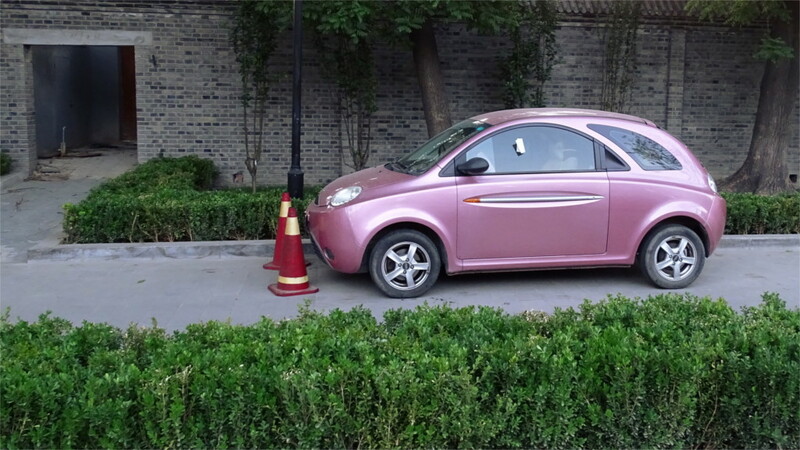 I took a photo and asked my Chinese colleagues the next day about pink cars. It turned out that these colours were also relatively new in China. My colleagues had roughly the same reaction to pink cars as me. I’m happy to see pink slowly diffusing over the world. Wat Pho, the temple of the Reclining Buddha, lies just south of the Grand Palace in Bangkok. The enormous gold leaf-covered figure of the reclining Buddha is inside a long and narrow temple which barely gives you a good view of the statue. The best I could do was to take a photo of a small statue of the reclining Buddha placed in front of the main statue. This is what you see in the featured photo. I hope it gives you a sense of the iconography, as well as the scale. The pavilion itself is breathtakingly beautiful. Far away, above the foot of the Buddha, I saw the paintings whose photos you can see in the panel above. They are immensely decorative, but the birds are very realistic. My limited experience with Thai paintings is that this is typical. There is no attempt at a realistic totality. Each element is completely realistic, but the sizes and their positioning are determined only by the aesthetics of the painting. The screen that you see in the photograph on the right is another example. The birds and the butterflies are each done with attention to detail, and rendered realistically. However, they are elements in a pattern, so their sizes bear no relation to the real sizes of the models. The result is that your eyes are overwhelmed with the decorativeness of the pavilion as you walk through it. The temple complex was not large, but there were statues everywhere. The central courtyard had a fountain surrounded by human statues. This area was very crowded with tourists. After a futile attempt to take photos of the fountain with no tourists in the frame, The Family wanted to move deeper into complex. 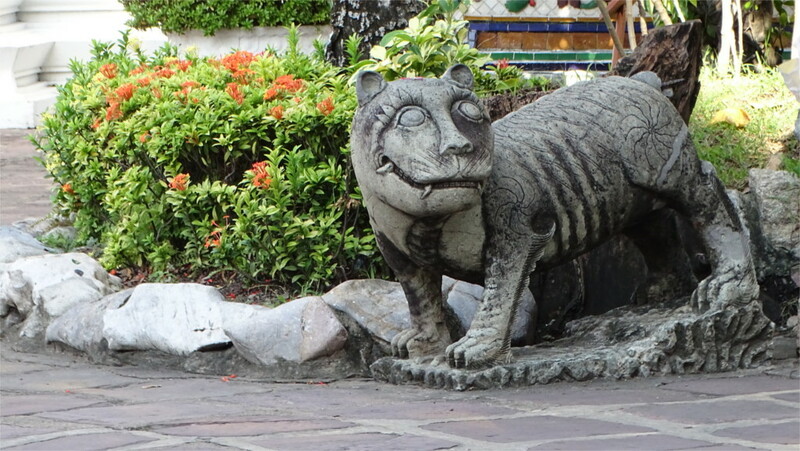 We found a quieter spot inside with a little garden with a stone tiger, whose photo you see above. It was a clear and very hot day. I sat down in the shade of a verandah, and drank a lot of water. 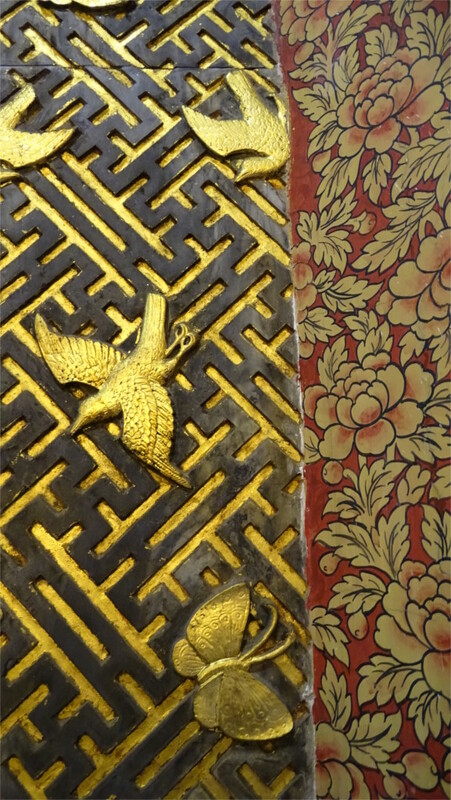 Wat Pho is not just another temple. Apparently the monks who lived here developed a system of healing and medicine which included the art of massage which the rest of the world now associates with Thailand. I’d been looking forward to a massage here. The garden I was looking at while I rested in the shade probably contained some of the herbs used in the Wat Pho style of massage. But it was too hot; I was wilting, and a massage no longer seemed like such a great idea. 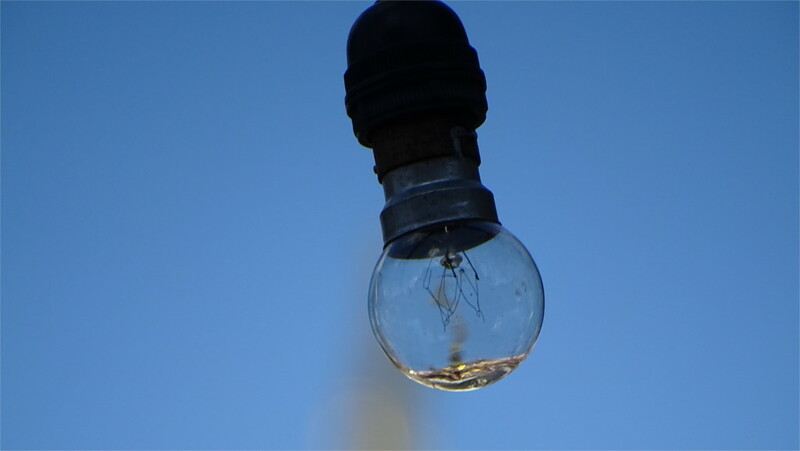 There were lightbulbs being strung up along the garden. The evening would have the full moon of November, the supermoon. It was the festival of Loy Krathong. Perhaps the lights were for that. The lightbulbs acted as lenses, and I could get a distorted picture of the golden spire of Wat Pho through it. That’s the picture you see above. Author I. J. KhanewalaPosted on December 19, 2016 October 16, 2017 Categories Architecture, Art, ThailandTags Bangkok, Loy Krathong, reclining buddha, supermoon, Wat Pho1 Comment on Bangkok? Wat Pho? From Yangon to Bangkok: a couple of hours’ flight seemed to take us through one century. Yangon holds on to glorious memories of the high noon of the British Raj: the early twentieth century. Bangkok is a expressway from the airport which lands you in a snarl of stopped traffic: the early twenty-first century. Myanmar is a country struggling to build a tourism industry. Thailand is the tenth most visited country in the world. We tried hard to do something different. Right in the middle of downtown, between tall malls full of the few tourists who are not in the famous beaches of Thailand is a very nice art space called the Bangkok Arts and Culture Centre. We walked into a lovely group exhibition of black and white seascapes on the ground floor (a couple of examples in the photo above). Every tourism poster from Thailand tells us of the immense photographic talent that the country has. This was a quick summary of that talent: beautiful photos by a dozen or so men and women. I bought the catalogue, and seriously considered buying a large print. We took the escalator up. The open galleries overlooking the central atrium were showing a retrospective of the life of the late king of Thailand. The country was still in the official mourning period, and the new king had not yet taken office. 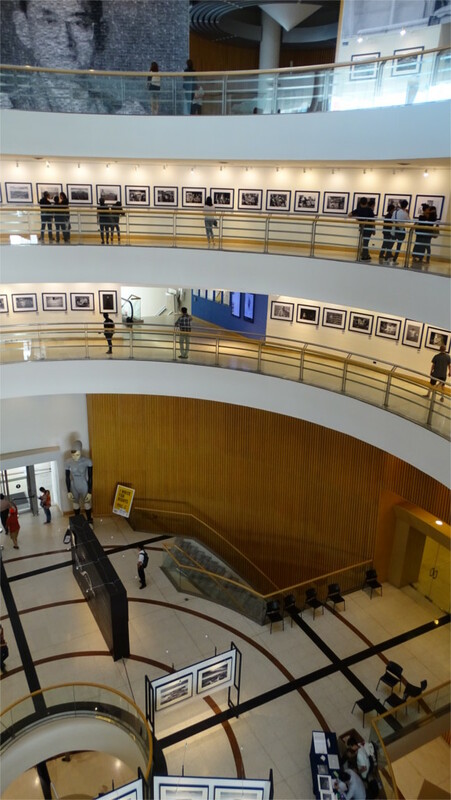 The series of galleries reminds you a little of New York’s Guggenheim Museum, except that you have to take an escalator between floors. At one end of each floor, near the escalators was a cluster of shops: art, food and more generalized shopping. The fourth floor has a wonderful ice cream studio (to coin a new phrase) which I’ve written about before. BACC is a wonderful space, and I would love to go back. The plate you see above arrived at the table where The Family and I eagerly waited for the treat. 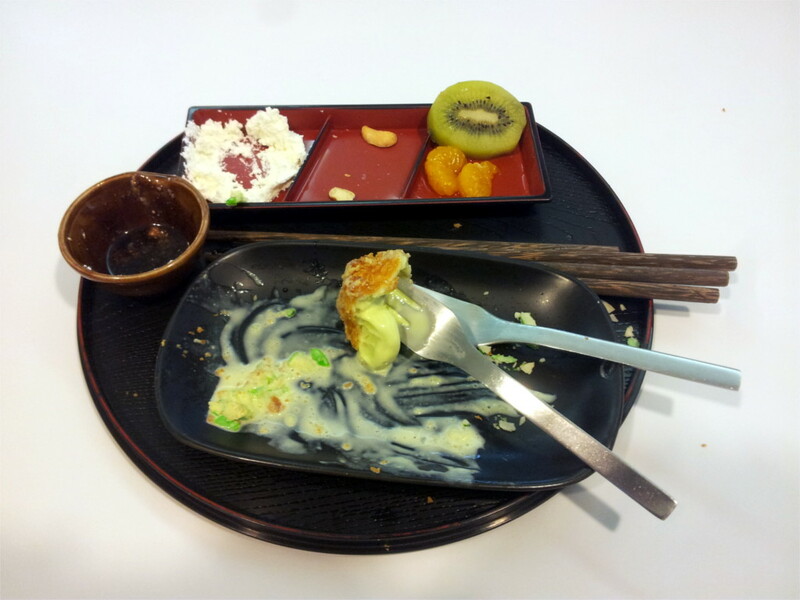 The fried smell of tonkatsu wafted off the plate. Although I’m a fan of most Japanese food, I don’t usually have tonkatsu. The deep-fried pork cutlet served with shredded cabbage is something I can often get in other countries. But here, I’d gone into a shop and after some discussion with The Family, chosen this over a steak. An in-flight magazine introduced me to the work of chef Prima Chakrabandhu Na Ayudhya. I read this with great interest, and then showed it to The Family. 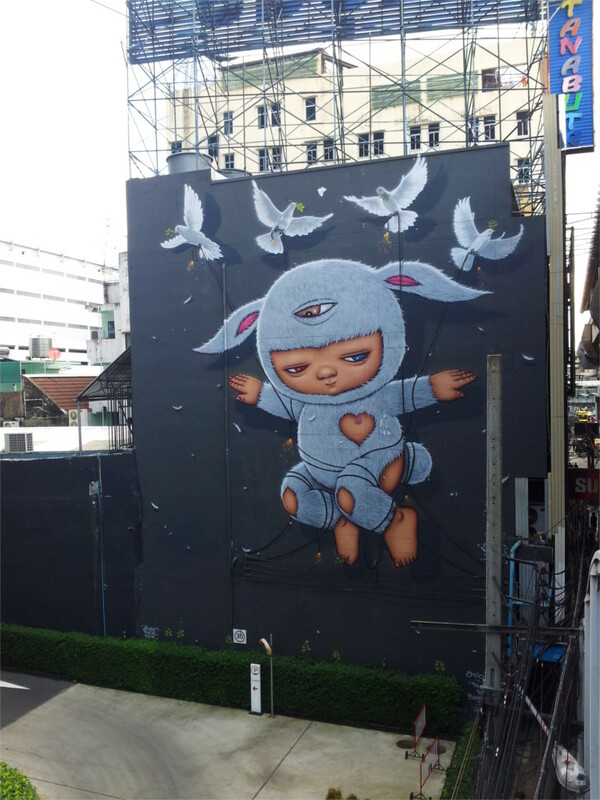 I noted that she has an outlet in the Bangkok Art and Culture Center (BACC) which was on my list of things to do in our short stay in Bangkok. Once there, we took the escalators up to the fourth floor eatery called Icedeas. Yes, as you can see from the photo above, it was an ice-cream. The Japanese melon flavoured slices were covered with fried bread to fool your nose as well as your eye. The shredded cabbage was a mint candy. The soya sauce is chocolate. Icedeas loves to play with the presentation. My niece took a look at my photos and said "It looks savoury. How confusing." We loved the confusion. We would have loved it even more if it had come as a surprise at the end of a good meal. July’s full moon was supposed to be a supermoon: the moon was almost the closest that it gets to earth. As a result it was 30 percent more luminous than a typical full moon. In Thailand this full moon marks the festival called Loy Krathong, when people float decorated baskets on a river. I was in Bangkok that night, but missed out on what must have been a beautiful sight. 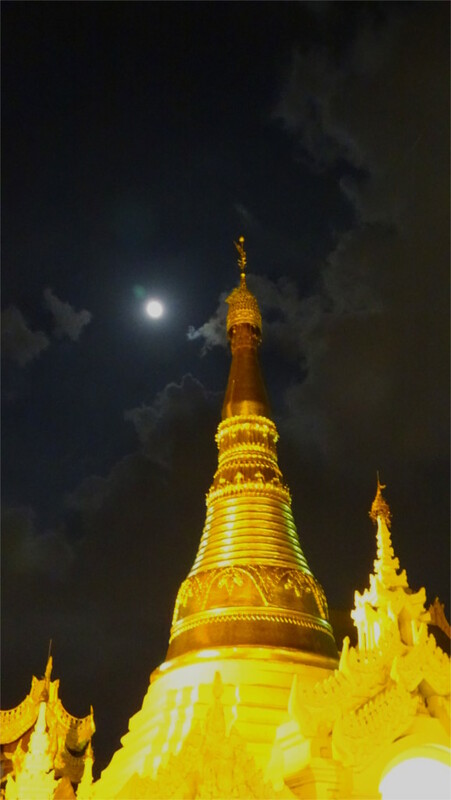 The previous night we stood near the Shwe Dagon pagoda in Yangon and watched the bright and nearly full moon asserting itself against the bright gold of the stupa. Already it was brighter than a normal full moon. The night after Loy Krathong I was on a flight back home. A couple of hours into the flight, cabin lights were dimmed and I looked out to see the bright moon paint the horizon a deep blue. The flight was empty, so I moved to a seat over a wing. The light was brighter than a normal full moon. Around local midnight I could take the featured photo without a tripod to steady the camera. I can see that the wing has come out sharp, but the engine is a little blurred from the vibration of the jet. But the spectacular bit is the sky: blue at the horizon at midnight!